We're enjoying an embarrassment of riches when it comes to TV technology right now. Whether it’s the panel you're looking at (OLED, LED and QLED all offer fantastic-looking pictures) or the content you want to watch (4K streaming and Ultra HD Blu-rays mean consumers now have a choice of where to get their high-quality content), we’ve never had it so good. But there are yet more innovations on the horizon that are set to change everything once again, aiming to improve both the TVs we buy and the quality of the pictures we watch on them. Whether these technologies will all be successful remains to be seen, but it’s going to be fun to watch them try and make an impact in an industry that's in an exciting state of technological flux. Much like how THX arrived in the 1980s offering quality assurance for sound in movies on the big screen and, eventually, the home, IMAX Enhanced wants to do this for 4K content. IMAX Enhanced isn't a standard as such, but an 'enhancement' to existing HDR technologies, with HDR10 required and HDR10+ optional. It comes with the promise of ensuring a high watermark for 4K content, both from an HDR point of view and in the way the audio is mastered. IMAX hasn’t created this certification on its own – it’s teaming up with DTS, which owns a series of digital sound technologies, for the audio side of things. This means that the only way to ensure you're able to get your products certified is by making sure DTS:X codec technology is integrated in home audio equipment; and if you have this, then you have the ticket to an ’IMAX signature sound experience’. IMAX says that to get the certification, equipment will be designed ”to meet a carefully prescribed set of the highest audio and video performance standards”. Those who've already signed on to making kit to this standard include Sony Electronics, Sound United (which owns Denon and Marantz), Sony Pictures and Paramount Pictures. Dolby Vision grabbed many headlines when it was launched, thanks to its promise to make sure the HDR you see in the home is the right sort of HDR. The problem was that its launch was beset with confusion. It was thought that in order for manufacturers to adopt it they would have to change the hardware of their products; it was then revealed that a firmware update would suffice. In the midst of all this, a handful of companies set out to create their own certification to rival Dolby Vision. Called HDR10+, it's a collaboration between 20th Century Fox, Panasonic and Samsung, and is an open standard, which means the cost to implement it is tiny compared to adding something like Dolby Vision to your setup. Having Samsung on board is a massive bonus, too, as it makes more televisions than anyone else. Both formats have their USPs, but the minimal cost of HDR10+ is certainly something that has got the TV world talking. All it needs now is support in the form of TV and movie content; this is coming from Amazon and Fox, but more will be needed if the technology is to truly succeed. It might sound like something that turned Bruce Banner green, but Hybrid Log Gamma isn’t anything that exotic, unfortunately – but it is an innovative new TV technology that you need to know about. Again, it has something to do with HDR – the TV tech around which there's the biggest buzz at the moment. What Hybrid Log Gamma does is simplify the signaling process of HDR so that it doesn’t take up too much bandwidth. 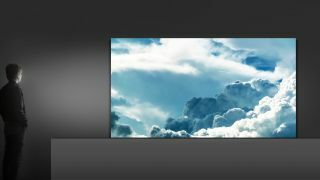 Now, this may not sound that impressive for the end users – those of us who want to watch glorious 4K content on our TVs – but the technology is of huge benefit to broadcasters, as it should mean they can deliver HDR broadcasts with their current setups, rather than spend a lot of money upgrading their systems to cater for this new technology. In turn, it's expected that we'll see a faster take-up of HDR than was first envisaged by broadcasters, which means lots of lovely super-bright pictures for the user. The technology has been developed by the BBC in the UK and NHK in Japan, so the brains behind it are some of the best in the business. There you were getting all comfortable with your brand-new 4K TV and Ultra HD Blu-ray player – and you’ve already been usurped. 8K is here, and the first sets will be in stores before the end of this year. Don’t let the tears flow just yet, though, as there's plenty of life left in 4K yet. It's a resolution that suits big-ish screens, but screens that are still pretty sensible for most living rooms. 8K, on the other hand, doesn’t really make sense unless you start buying screens that are 80 inches plus – so unless your living room is about the size of a gymnasium. But if you can fit the TVs into your home then the technology is impressive – 8K has 16 times the number of pixels of a Full HD 1080p display. That said, given the lack of dedicated content, and with 4K being really rather good at the moment thanks to HDR, 8K is very much a 'nice to have' tech for early adopters, rather than 'must have'. LG may have revealed an 8K OLED TV at IFA 2018, but it was only on the show floor for minutes before it was whisked away to show off to potential buyers of the screen. That meant something else had to shine on its stand – and MicroLED was there to offer some much-needed ‘wow’ factor. It’s a technology that's also being developed by Samsung at the moment. MicroLED is the first new screen tech to come out in over a decade, and while it's nowhere near ready for mass production that doesn’t stop it from being fascinating. As the name suggests, MicroLED uses LED technology that’s been shrunk down to microscopic levels. The LEDs are self-emitting, too, as with OLED, so brightness levels are comparable, but where OLED uses an organic substance (that’s the ‘O’ in OLED) MicroLEDs don't, so degradation over time should be far less. There is a problem, though: it's extremely difficult to manufacture MicroLED panels, as millions of LEDs need to be put into precise alignment. It’s so fiddly that even robots get confused, which is unfortunate, as even the slightest misalignment and the whole picture is off. This means mass production is unlikely any time soon – although saying that, it was a long time before we saw OLED prices start to drop, and that was because the nature of the manufacturing process meant a lot of panels broke. That issue has been fixed, so there’s a good chance we'll see a similar breakthrough for MicroLED.